Rick Bowman is the featured artist for the month of November at Vines & Rushes Winery. He has lived in Oshkosh for about forty five years with his wife Mary. Rick has a degree from UW-O and has been retired from the Oshkosh Public Library for ten years. This gives him plenty of time to relax, play and work on multiple hobbies. 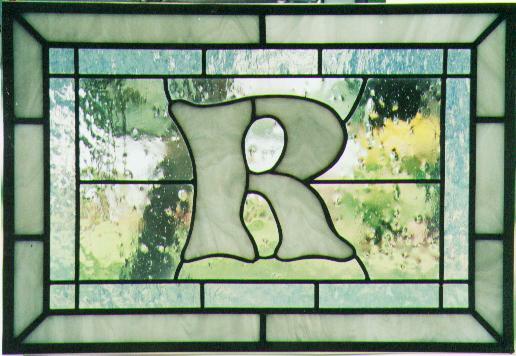 Rick and Mary Bowman started working with stained glass about fifteen years ago after taking a class at Fox Valley Tech. Mary decided early on that she prefers the designing of pieces, including coordination of glass and colors, while Rick prefers cutting and assembly. The majority of their work is either given as gifts. However, occasionally they have entered their work in different art venues or fund raisers. Rick has many hobbies, usually involving making things. Making wine and stained glass are at the top of his list. He does a lot of wood working including having made a number of cedar strip canoes, cabinets, and tables. His latest venture has been in learning to turn wood into beautiful candle sticks, bowls or bird houses. Grab a glass of wine, wander through our "gallery" and admire the Bowman's beautiful work.